Chlorine is commonly used as biocide in Cooling Towers and HVAC Units. Chlorine is corrosive, hazardous to use, transport and store, environmentally damaging and carcinogenic. It is non-effective against viruses. GO2TM is ideal for application in cooling towers and HVAC units as a broad-spectrum disinfectant for eradication of micro organisms. 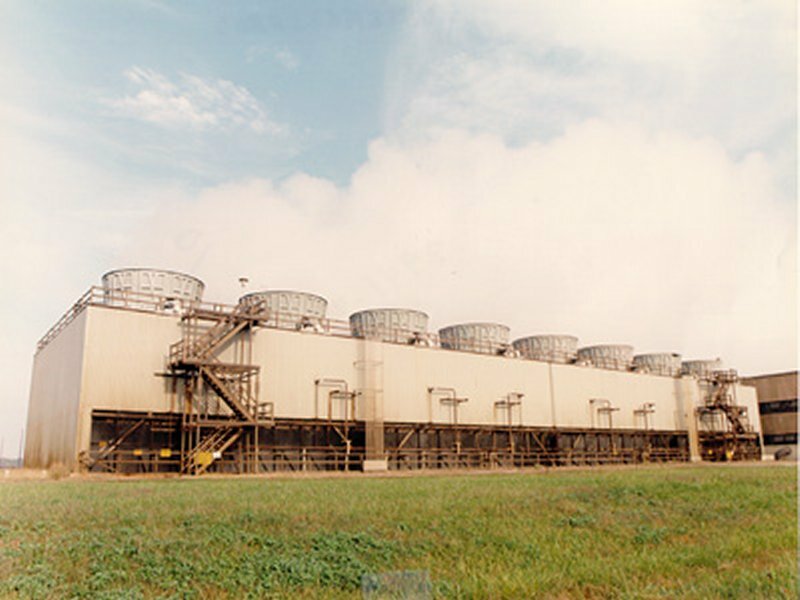 The warm/hot water environment prevalent in cooling towers is an ideal breeding ground for slime and harmful viruses, such as Legionnaires Disease (Legionella virus). Studies conducted in the hot and cold water distribution systems of hospitals, hotels, residential and commercial businesses have shown a surprisingly high incidence of Legionnaires Disease (more than 40% incidence in the buildings subject to inspection). In Europe, regulations governing facilities where the general public remain overnight (hospitals and hotels) will shortly require mandatory inspection, reporting and treatment of incidences of Legionnaires Disease. In the US studies have demonstrated chlorine dioxide as an effective new tool in the war against legionnaires Disease. Additionally, slime growth reduces the thermal efficiency of cooling towers, thus defeating their design purpose and increasing the costs of operation through higher electrical power consumption, increased maintenance costs and down-time. GO2 is simple to use. The user mixes two powder components to a specific amount of tap water to produce a 4,000 ppm chlorine dioxide concentrate. The mixing process requires a reaction time of 30 minutes. This can increase to 3 hours, depending upon the water temperature. The shelf life of GO2 in powder form is 5 years and, when mixed in concentrate form is 30-60 days. GO2 has a high bactericidal, algicidal, fungicidal, sporicidal and virucidal efficacy. Test results for Legionnaires Disease eradication using GO2 at a US hospital are featured on this website. The Tests were conducted by a leading US specialist in Legionnaires Disease and proved extremely successful. Biocides are the "elite" of chemicals used for eradication of micro organisms. When choosing a micro biocide several factors play an important role e.g. the effectiveness or based on scientific differences. Chlorine is common used as biocide. Besides chlorine also chlorine dioxide, hypochlorite, ozone, UV-light and sulfur-compounds are used for eradication of micro organisms. GO2 does not form toxic by-products. It is benign to the environment and safe for humans to use. GO2 is effective through a pH range of 4 to 11, at normal temperatures, without the use of additional chemicals to regulate pH levels. GO2 is non-corrosive to materials, equipment, facilities and water distribution system. Initial treatment will require GO2 concentrate to be added at the rate of 10 liters for every 1,000 liter of water in the system. The required dosage may vary with water conditions, temperature, biological demand and the degree of contamination present in the water distribution system. GO2 concentration should be regularly measured for the first ten days to ensure the dosage level is maintained at a level of 0.4 to 0.8 ppm. If the concentration decreases below this level, additional GO2 concentrate should be added, as required. After treatment the ongoing dosage levels can be reduced to +/- 0.2 ppm to maintain slime-free and virus-free Cooling Towers and HVAC systems. GO2 is available in package sizes from 1L, 5L, 10L, 25L, 50L, 100L, 200L, 500L and 1000L. Bulk containers can also be arranged upon request.